The nine interns were up bright and early this morning for breakfast and work on Wednesday morning (Perhaps the other 8 earlier than me!). 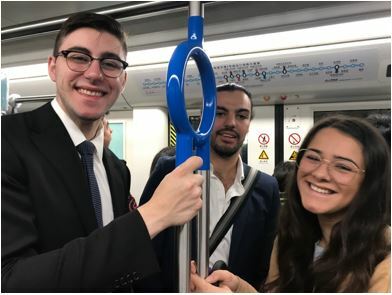 After a quick breakfast on the go we started to make our way towards the metro for our morning commute to Shanghai Tower where 8 of us are interning at different firms. Sanah, Nick and Christian are at AllBright and Josh, Will, Monica, Tyson are at Dentons. Due to the fact that we all work in the same building and live in the same hotel, we often start, finish and eat together every single day. At this point we have fallen into a comfortable daily routine during which we all see each other at different points throughout the day. After getting to work at about 9 o’clock, our work day officially started. 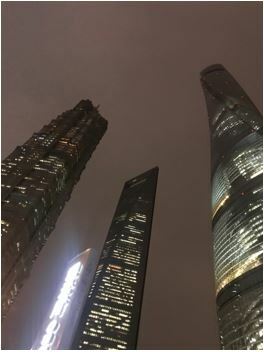 I’ve been fortunate enough to be placed within Dentons in Shanghai and working generally in the area of corporate law and corporate governance. Up until now, I have been focused on research about certain areas of International law and its relevance to Chinese law and business practices. This experience has been invaluable because it covers so many different areas of Chinese law. On top of that I’ve received some very helpful tips on the most useful online databases to use for legal research in China. We often get lunch around midday in the Shanghai Tower cafeteria. We tried a new Korean restaurant today and were all very pleased with the amount and quality of food we had. 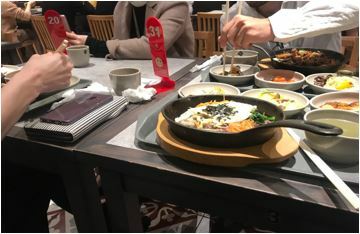 The seaweed soup on the side was especially good since half of us are currently recovering from a cold. The rest of the afternoon was also spent at our desks trying to give one last push to the tasks we were given. Since every intern at Dentons has been placed within a different senior partner’s team, our assigned tasks are quite different from one another. Today I was mainly tasked with finalising a research summary and will be spending tomorrow researching international cases. The walk to the metro station after work still isn’t old! I can confirm most of us still take photos of the view of the towers most nights and tonight was no exception. This entry was posted in Student and tagged China internship, China Study Tour Internship, Internships. Bookmark the permalink.